It’s almost that time again, when the thoughts of kids everywhere – no matter whether they’re big or small – turn to chocolate and bunnies and more chocolate. If you’re looking for ways to distract the kids – or yourself – from chocolate daydreams, then you’ve come to the right place. 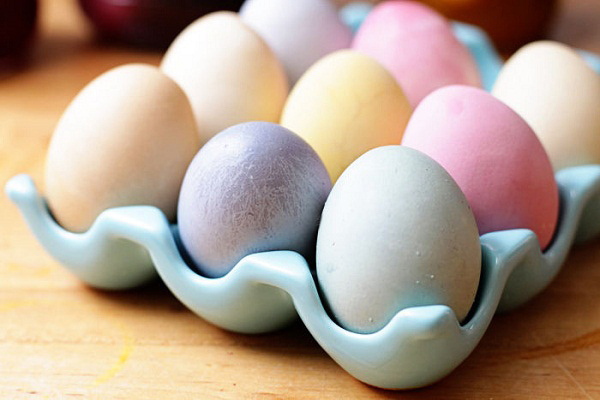 We’ve a stack of ideas for fun Easter crafts with nary a chocolate bunny or chocolate egg in sight. Back in the days before kids expected to score eggs carved from sugar-laden cacao for Easter, families used to dye their own, just like these. 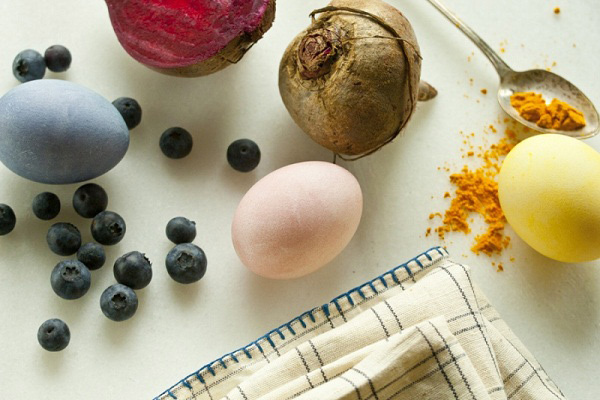 Find instructions on how to recreate this time-honoured and lovely tradition at home using natural dyes from vegetables, fruits and herbs over at Minimalisti design blog. If you want something a little more challenging, how about the traditional Ukrainian art of pysanky. Both my parents are Ukrainian and every Easter my kids go to their baba’s house to have a go at making their own Ukrainian eggs, using wax crayons for the real littlies and hot wax via special tools called kistkas for the older ones. Granted, theirs aren’t quite as swish yet as this beauty spotted over at Castle of Costa Mesa, but it’s a lot of fun. 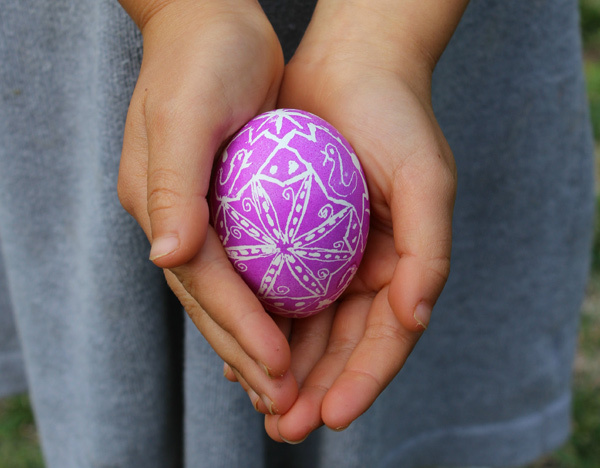 If you want to try some East European folk art this Easter, you’ll find some easy patterns and how-to’s over at Learn Pysanky. 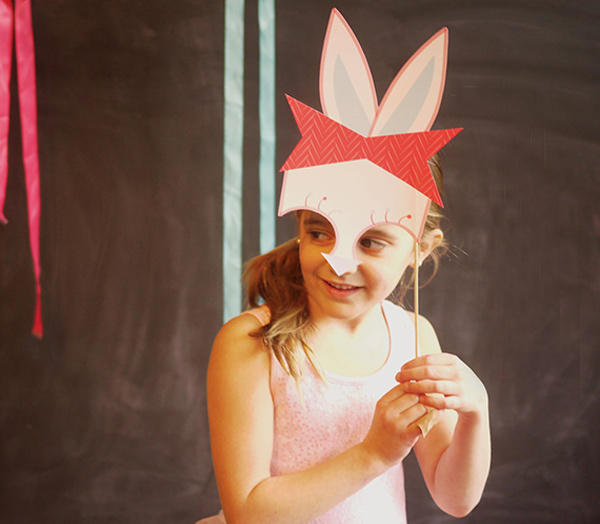 Put some extra fun – and sass – into your family Easter snapshots with these funky Easter photo booth props from Julep on Minted. There’s even a pirate bunny for Easter buccaneers. Simply print the mask templates, cut out and snap away. Now how about some more bunny love? 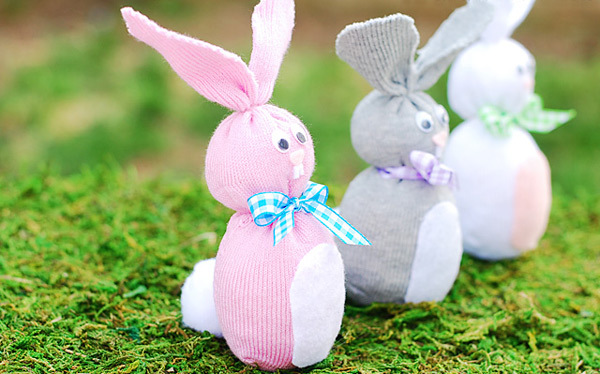 I adore these sweet cuddly Easter bunnies made from odd socks. And guess what? You don’t even need to know how to sew to make them. Given the size of our odd sock bag, I’m aiming for a whole burrow of bunnies this Easter. Find all the instructions for creating your own burrow-full of Easter bunnies over at A Pumpkin and a Princess. Show me a little girl who doesn’t love glitter and I’ll swear off chocolate forever! (Yep, even Easter bunny ears which, as everyone knows, is the very best chocolate of all). So I wonder what all those little glitter-loving girls will make of this craft project. 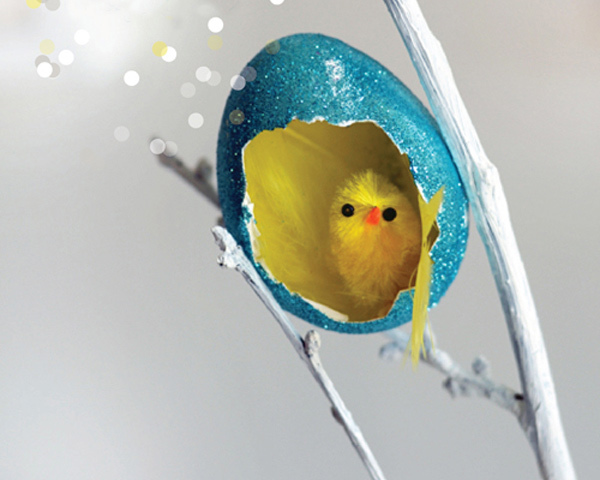 Glitter eggs with a sweet little Easter chick hiding inside. Aaaaaaw, they’re sure to say. All the details for creating these pretty scene eggs are at Willowday. Mini terrariums are so hot right now and here’s some you can make with the kids. Don’t just love them because they’re totally adorable, love them because they’re super easy to make and will give the kids something fun to do one afternoon during the Easter school holidays. Send the kids over to Shelterness for detailed instructions. 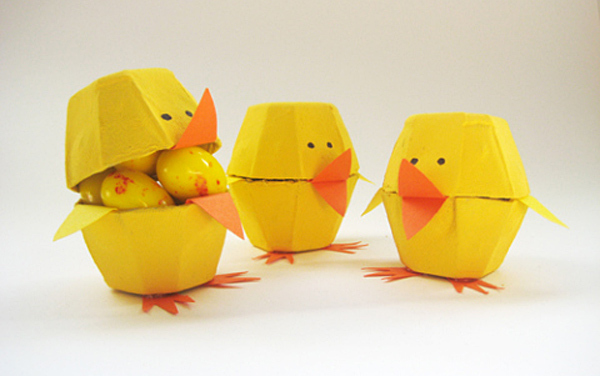 If that’s not enough chick craft, get a load of these egg carton cuties we spied over at Paper, Plate and Plane. Toddlers will be in raptures over these and you’ll be able to put those empty cartons left after all that egg dyeing to good use. Here’s something older kids and tweens will love. 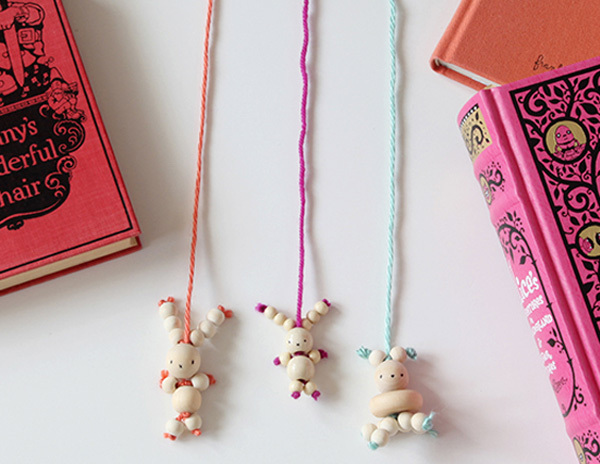 Bunny bookmarks made from wooden beads. Adorable and easy to make, they’re an ideal little Easter gift for chapter-book reading children. Just send the kids over to Small For Big to find easy-to-follow instructions and then let them make one for all their besties. These funny Easter egg heads crack me up, so I”m betting they’ll have the kids in stitches too. 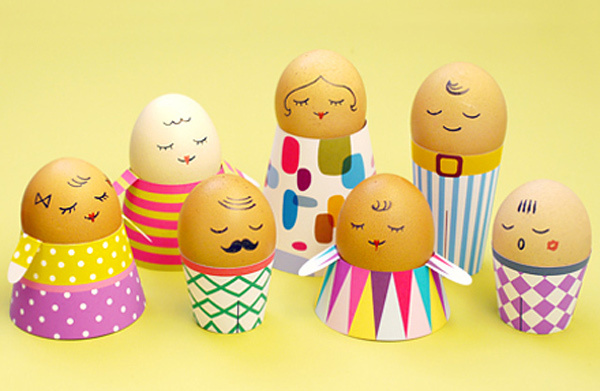 They’re easily made – just use Sharpie pens to etch on the face detail and then add the paper egg cup outfits using free print-at-home templates over at Mr Printables. 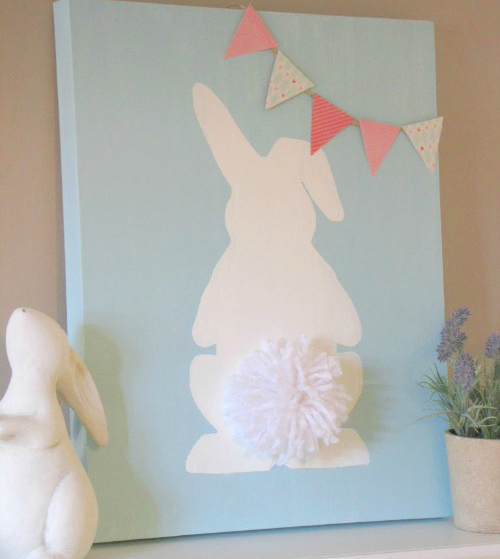 Now how about a way to mark baby’s first Easter… and create a sweet piece of art for the nursery wall at the same time? Hop on over to Clean & Scentsible for a step-by-step guide to making the cutest little bunny canvas you’re likely to see. 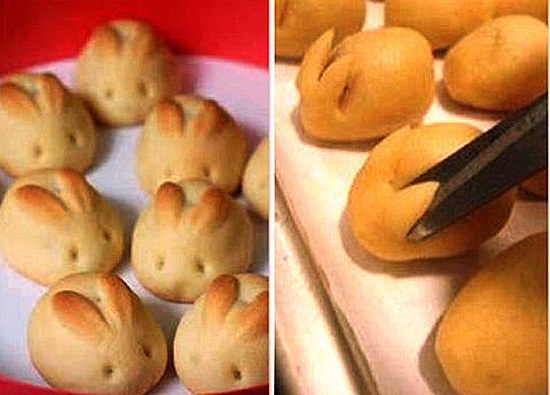 All that crafting sure builds up an appetite, so how about some bread roll bunnies to finish up. We spotted these honey bunnies over at Make Life Special and just had to include them here, blurry photo or no. The lil’ darlins are the perfect accompaniment to Easter lunch or brunch and who knows – they may even encourage the kids to eat something other than chocolate on Easter Sunday. 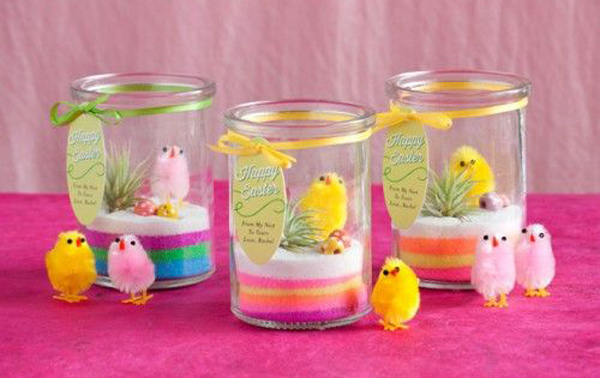 Happy Easter crafting and make sure to check our archives for more fun Easter ideas!